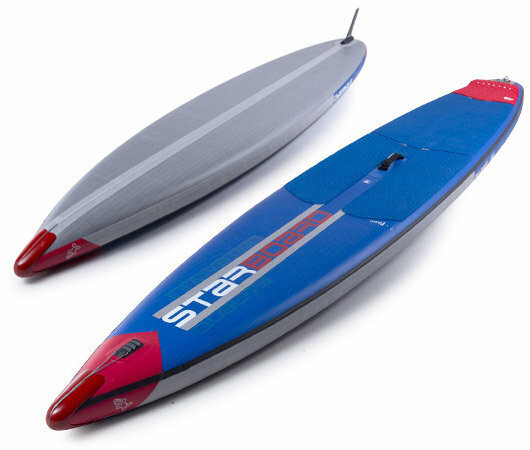 Een prachtig inflatable Race board is de Starboard All Star Airline. 14x28 staat voor zowel snelheid als stabiliteit. Als het gaat om de laatste ontwikkelingen op Race-gebied, dan is Starboard altijd nummer 1. Uiteraard dus ook bij het inflatable race-board All Star. 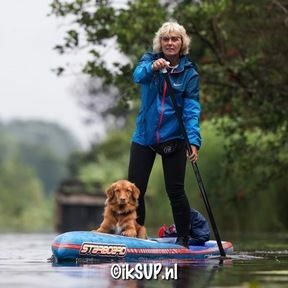 Het board is uitgevoerd met allerlei technische snufjes (zie verder op deze pagina) waardoor dit board absoluut tot de toppers in het inflatable Race-gebeuren behoort. Key features: Nose cone, loop and hook with a pre-stretched High Tension aramid fiber cable providing unparalleled stiffness and rigidity. The inflatable All Star range is exclusively available in the new Airline Deluxe Technology. Fins: Supplied with US center box, FCS Touring 9" fin. Widest outline provides added stability so the rider can reserve energy from balancing and instead use it to maximize paddle power. The wider outline gives extra control in choppy conditions, while the flat rocker maximizes glide for the fastest speed on flats. OUR MOST SIGNIFICANT BREAKTHROUGH IN TUNING ROCKER LINES AND DEFLECTION. The patented Airline Technology utilizes a pre-set free-floating cable. It is attached to the nose, goes under the bottom and ends at the fin box. The preset cable is slightly shorter than the board so when the board inflates, the cable comes under tension and stiffens the board significantly. We measured 1.8 cm less hull deflection in testing and 2016 World Champion Connor Baxter swears by it. Could this efficient, lightweight technology change the future of inflatable performance boards?